Referees, and goal and sideline umpires, are an integral part of the game. We do our best to develop the standard of refereeing and ensure that our officials are also enjoying the games in which they participate. 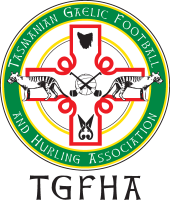 Referees are paid for officiating in TGFHA matches. Training, equipment and referee uniform are also provided. Our next Referee Training Course is set for Fri 11 November 2016 in Hobart, 5.30pm onwards. Please contact us if you are interested in attending the course. The course is free and will take approximately 3 hours. Refreshments provided. • Ambition – could you referee an Australasian final or a major tournament? 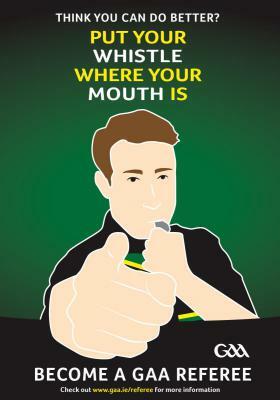 Check out the referee portal on the GAA website for lots of good tips and information. • Clear practice balls from the field and position match balls. • Whistle to bring captains to centre. Shake hands. • If there are any issues to clarify with captains, do so. • Invite 'home' captain to toss, other to call. • Team winning toss has choice of ends. • Place ball on ground at end of centre stripe. • Count players per team. Look for caps or jewellery and ask for removal. Ensure players are in position: 2 to contest throw-in, either side of stripe; all others are behind 45m lines. • Check sideline and goal umpires are ready. • Check goalkeepers are ready. • Stand over the ball and start your watch. • Throw the ball in. Aim to land the ball to land on the centre stripe between the two sets of players. In the event of a mis-throw, whistle to stop play then throw in again. Enjoy your game! • Stay mentally involved with the play; you are not a spectator. • Adjust your positioning to get clear view of play from a distance of 10-25m. • Consider whether players: - genuinely attempt to play the ball - challenge 'off the ground' - use excessive force - act recklessly in a manner that could cause injury • Use peripheral vision to look for other fouls such as blocking, holding, etc. • Adjust whistle intensity to severity of foul. • Move in assertively to take control after whistling. • As you move in, keep your eye on the offender and think how you will deal with him/her. • Deal with any injured player(s) first. • Is verbal warning, tick or card needed for offender? • Only allow play to restart when you have dealt with all issues. Enjoy your game! • Confirm your match appointment with the Referee Coordinator by SMS or email. • Set a diary reminder diary for game day and time. • If you have your own referee kit and equipment, make sure it is clean and ready to go. • Arrive at ground at least 30 minutes before throw-in. • Introduce yourself to the duty Match Manager and deal with any issues that may affect the match. • Put out the sideline cones and kicking tees (first match of the day). • Check the nets and goalposts to make sure they are secure and not hazardous. • Check that team colours and jersey numbers are adequate. • Inspect team sheets and fill out match book. • Check match balls, whistle, watch and cards. • Brief goal and sideline umpires and allocate to positions. Enjoy your game! • Consider the type of foul committed and its severity. • Do not play advantage if there is a player injured. • Quickly analyse whether the team fouled - have a clear advantage - have the opportunity to develop play • Identify the offender in case you need to come back to him/her. Identify the location of the foul. • Call “advantage!” and raise one of your arms. • Count 5 seconds. - if the advantage remains, lower your arm and allow play to continue. - if no advantage, whistle and restart with free-in from the place the foul occurred. • If the offender needs to be dealt with, do so at the next stoppage in play. • When in doubt, do not play advantage. The benefit to the game must be clear. Do not put your control of the game in jeopardy. Enjoy your game! • Identify the offence and make sure of its location; consult with other officials if in doubt. • Whistle, move in, take control, remain calm. • Carry out disciplinary sanctions if required. • Place the ball (or indicate kick location) and ask for it not to be moved. • Tell the attacking team to wait for your whistle. • Ensure the defending team are back the required distance: - 13m from any free-in - outside 20m line and arc for penalty kick • Reposition yourself. • For penalty kick - identify who will take the kick - make sure goalkeeper is on line - ensure goal umpire is observing goalkeeper - observe any encroachment and deal accordingly • For a 45m free, keep an eye on 'square ball' infringements. Enjoy your game! • Consider & evaluate the intent and seriousness of the foul play. • push, charge GK in small rectangle, charge by player in possession - YELLOW for persistent fouls. • holding, fist around body, charge to back or front, shepherd, charge player not in possession, charge player kicking, charge not in direction of ball - TICK, then YELLOW for repeat offence. • foot block, general rough play, simulation - YELLOW • deliberate pull down, trip, deliberate late collision, aggressive remonstration with official, abusive language or gesture to any other player - BLACK • strike with hand/elbow/knee, kick opponent, dangerous play, spit, melee, abusive language to official, stamp, assault, racist/sectarian behaviour - RED • Incidents pre-game, post-game and at half-time can also be penalised. Enjoy your game! • All officials should group together if any trouble brewing. • Confirm the final score and match result. • Keep an eye on the dugouts as you leave the field. • Finish your paperwork promptly. • Be as accurate as you can in describing any incidents and use the 'language of the rules'. • If a player is being reported for any kind of verbal abuse, write down the exact words used. • If there is any challenge from teams/staff, acknowlege their concerns and invite them to submit a written report. • Feel free to socialise with players but avoid any lengthy discussions of on-field issues. Encourage all involved with the game to accept decisions already made and move on. • Put your kit away and prepare it for the next game. Congratulations, you have done a job that is essential to the integrity of the sport. • Knows the playing rules well. • Is physically and mentally fit. • Has the ability to remain calm. • Has the moral courage to take decisions which are correct, regardless of how they may affect the game outcome. • Is dedicated to creating a fun, safe playing environment for players of all abilities. • Is willing to get involved where/when you need to get involved. • Is able to work in a team of officials to effectively manage the game. • Is prepared to accept feedback and work on improving own performances. • Can keep a positive mindset while under pressure and scrutiny. • Maintains empathy with point of view of players, coaches and other participants. • Can apply rules and interpretations consistently.